Imagine my amazement when my colleague Franklin Sirmans, curator of contemporary art, asked me if I would be interested in displaying a major painting by John Biggers (1924–2001), one of the most important African American artists of the twentieth century. Biggers’s masterpiece, Shotguns, Franklin told me, was available for long-term loan. Needless to say, I was very excited about the prospect and jumped at the opportunity. 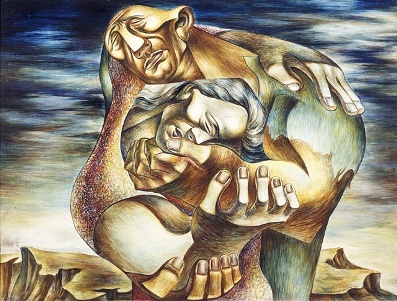 Not only is Shotguns widely considered one of Biggers’s most important achievements, but also the loan would offer us a chance to display—in context—the first (and only) John Biggers in LACMA’s collection: the monumental Cotton Pickers, an extraordinarily powerful drawing from 1947 that we acquired in 2007. 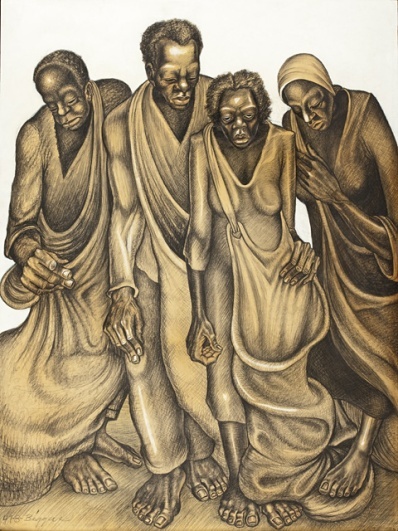 In the 1940s, Biggers created large drawings of extreme pathos like Cotton Pickers, in which four workers are isolated from any landscape setting and grouped together as if a monumental bronze sculpture memorializing their labors. 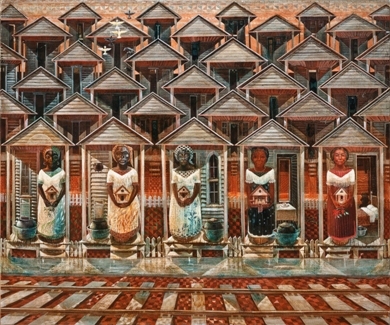 Forty years later, Biggers’s heightened realist style had evolved into more symbolic vision of African American community life in which he emphasized its foundations in African culture. In Shotguns, a dense pattern of quilt swatches extends into an accumulation of the rooftops of shotgun houses, an African-influenced form of architecture prevalent in the American South. Five caryatid-like women, contained inside their porches, each hold a model house and stand next to traditional evil-catching cast-iron pots. Those with features resembling African sculpture (left) block their doorways, while the two grandmotherly figures (right), who allow views inside their homes, are transformed into modern-day cultural guardians. 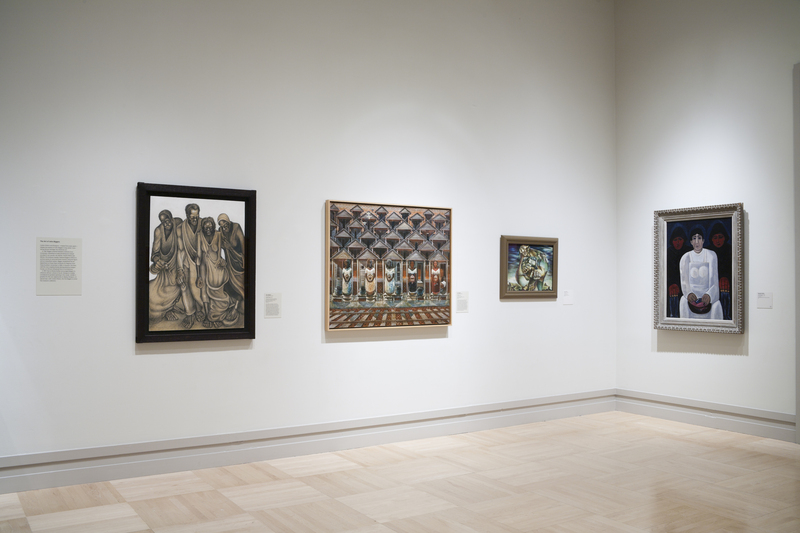 To underscore the significance of Biggers’s art and the inaugural presentation of these works at LACMA, we have organized a panel discussion about Biggers on Tuesday, January 18, including artists and scholars who knew Biggers at different stages in his career. Biggers’s art will also be featured in family programming scheduled for LACMA’s next Target Free Holiday Monday on Martin Luther King Jr. Day next week. This entry was posted on Thursday, January 13th, 2011 at 10:08 am and is filed under Uncategorized. You can follow any responses to this entry through the RSS 2.0 feed. You can leave a response, or trackback from your own site.